Trello is a project management tool that exists as a web-based application, but also as a Android, iPhone, and iPad app. Trello is based on “lists of lists”: content is organized in Cards, which are placed in Lists, which are themselves parts of Boards. 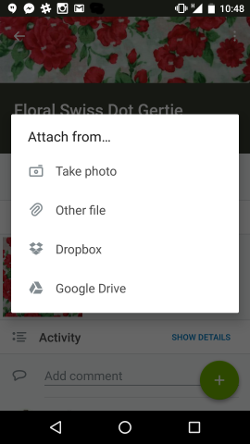 A card can host many types of content: notes, links, images, attachments, checklists, etc. The user interface is super intuitive, cards can be dragged and dropped around, copied and archived. It can also be used collaboratively so that several people can work together on one board, and it sends notifications when changes have been made. Trello is free, all you need to do is create an account and you’ll be able to use it on these different platforms. There is also a premium version, which brings mostly collaboration features, but also unlocks some nice customisation options. So if you register by clicking on this link, you’ll make me win a free month of premium, which will allow me to add fancy background pictures to my boards (hehehe). In a professional context, Trello is often used to implement the Kanban method: a board is linked to a specific project, each card corresponds to a task, and lists are used to visualize the tasks’ advancement (“To Do”, “In Progress”, “Blocked”, “Done”). I used it to manage my research projects in my former job, and now I’m using it again at Deer&Doe, but I also use it to manage pretty much every aspect of my life, from Christmas presents to meal planning. Okay, so, that’s nice and all, but you guys are waiting for me to talk about sewing… Here we go! In each of these cards, I write in the “Description” field the yardage, fiber content and source of the fabric. I always prewash my fabric as soon as I get back from the store, but if you don’t do that then you might want to write down if the fabric has been prewashed or not, that might save you from some unpleasant surprises! I also add to each card a picture of the fabric, that I take with my phone or my tablet. To do so, I open the card from the mobile app, tap on “+” to add an attachment and then tap on “Take photo”. 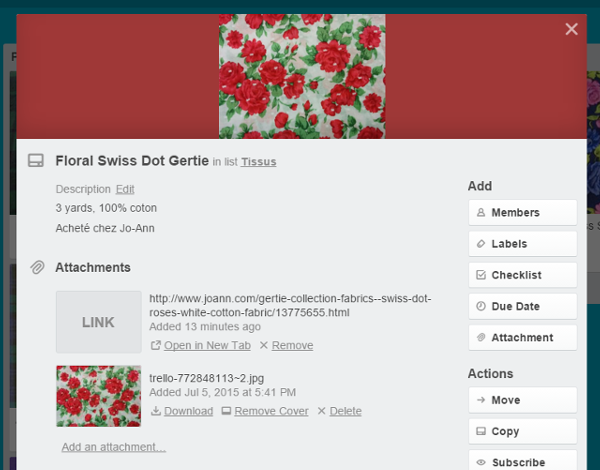 Trello also allows you to add links to cards. If I bought the fabric online, or in a store that also sells on the web, then I add a link to the fabric so that I can share it on my blog later. 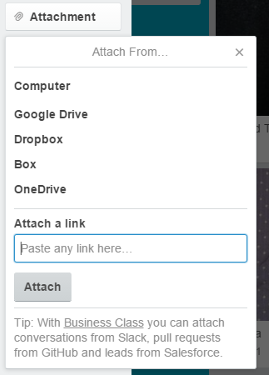 All you need to do is click on “Attachment” and paste the url in the field. You can also add comments. I use those to write down notes, such as ideas of patterns that could work with the fabric but that I’m not set on yet. I also have a In progress list in which I move cards when I get started with their projects, which also helps me limit the number of projects I tackle in parallel. Once a project is done, I remove it from that list, but I don’t archive it yet! 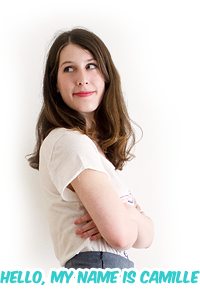 I also use Trello to plan my blog posts… But I’ll talk about this next time! wow, thanks for this, it seems ideal for organising. I just had to tidy my fabric stash and ran across a few pieces of fabric I completely forgot I had… And don’t even get me started on my patterns! Anything that will help is much appreciated. Haha that’s great, surprise fabric! I’m going to share something about patterns soon but I am a bit of a pattern hoarder, and I still have a loooong way to go before I get all of mine in the system! Great idea! I have been using Trello for a while, but I hadn’t thought of using it to keep track of my stash, so thanks for this tip! This is so smart! 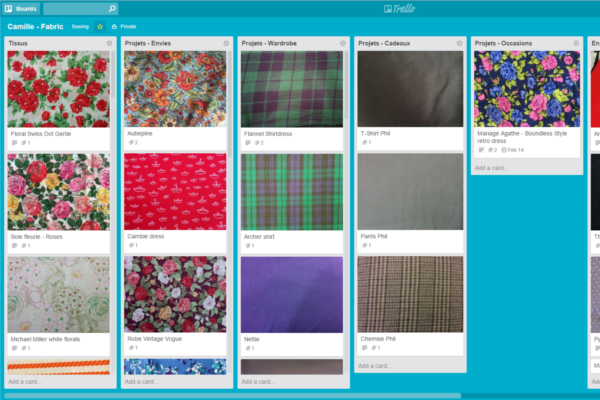 I use Trello for work but never thought to use it for sewing. Seeing your stash so nicely organised makes me feel all calm and happy! This looks so great – thanks for sharing it! 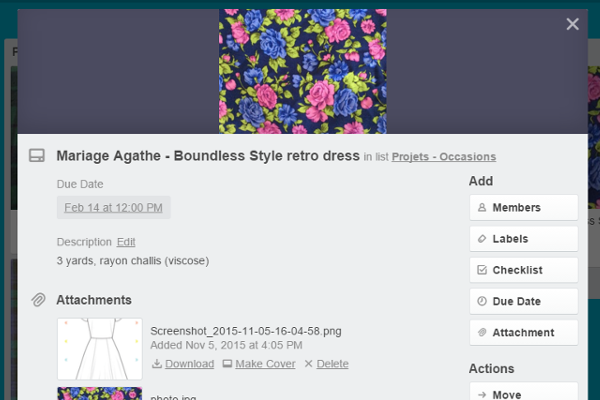 Currently I use Evernote to catalog my patterns, but it can be cumbersome sometimes. I use physical cards with fabric snippets on them to catalog my patterns, but I’m always getting behind in cataloging, plus I can’t take a huge stack of cards with me every time I go to the fabric store! It would be great to centralize everything, so I’m looking forward to seeing how you use Trello for patterns. I’ve never used Evernote for it, but I had started with a paper list, then a Pinterest board, but at that point my pattern stash really outgrew these systems. I’ll share my Trello method soon but it’s more of a work in progress than the fabric organization so I’m looking for any feedback or idea you might have (still trying to figure out if a tag system is worth the effort…)! Love how you set up your fabric stash! I got all my patterns in Trello during my Christmas break and, seriously, best thing since sliced bread!! This is exactly what I was looking for, but I didn’t know it.